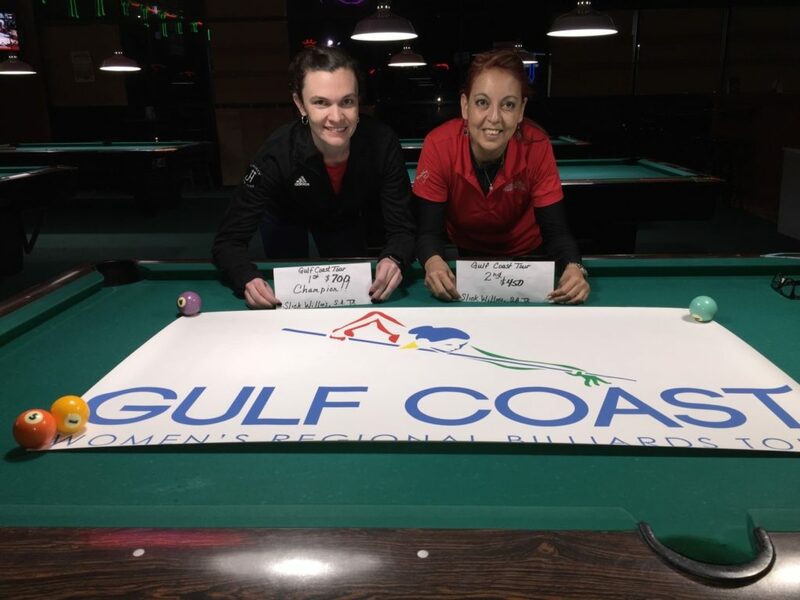 Ellen Robinson dominated a field of forty-nine players, to capture her second, 9-ball tournament win, on the Gulf Coast Women’s Regional Billiards. Robinson met Kim “Texas Heat” Pierce in the final, clenching the first set, 7-5, and her second victory of the 2019 Tour season. 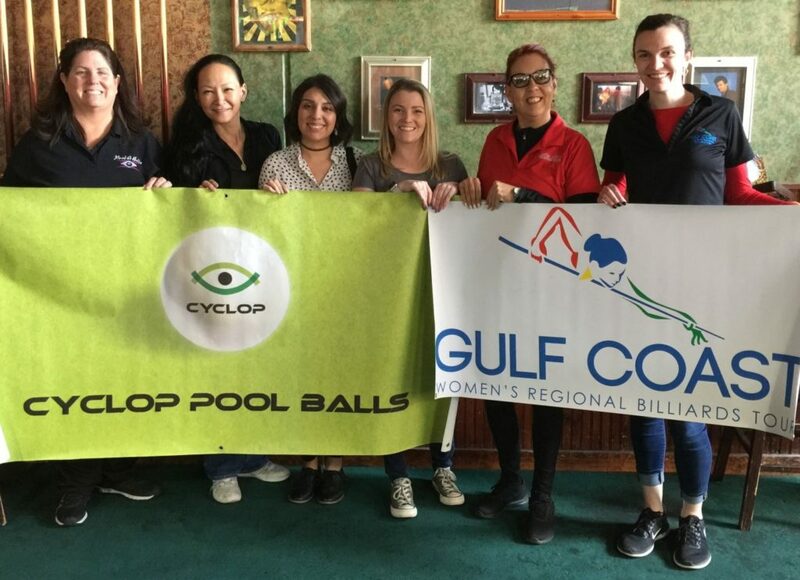 On March 23rd-24th, 2019, sponsors Cyclop Pool Balls, Poison by Predator Cues, APA of North Harris County, Vapor Knights USA, and Outsville Billiards, facilitated another successful event for the Gulf Coast Women’s Regional Billiards Tour, paying over $2,000 in prize money, for the two-day, $1,000 added women’s 9-ball event. This event marked the Tour’s first-ever event at the famous Slick Willies Family Pool Hall in San Antonio, Texas, and amassed a record forty-nine players, including a large representation from the San Antonio pool community. The Gulf Coast Tour would like to thank Slick Willies’ Director of Operations, David Kimmey, and his entire staff, for hosting a first-rate event. The next event of the 2019 Tour season is April 27th-28th, at Slick Willies Family Pool Hall, 9310 Westheimer Road, in Houston, Texas. On Saturday, matches commenced around noon, and the field was whittled down to the final twelve for Sunday. On her way to the winners’ side final four, Ellen Robinson took no prisoners. She logged victories over Teresa “Princess of Pool” Garland, 7-4, Michelle Abernathy, 7-6, and Brandy Fendley, 7-1. Kawania Watson tagged Jackie Rodriguez, 7-4, Kim Pierce, 7-5, and Yvette Cox, 7-4. Millie Aicinena stormed through Celeste Espinosa, 7-0, Ashton Barak, 7-0, Sophia Lopez, 7-5, and Brittany Winkel, 7-1, while Austin’s Stacie Putnam defeated Margaret Fox, 7-2, Yvonne Asher, 7-3, and Tam Trinh, 7-5. As the winners’ side final four took shape, action was in full swing on the one-loss side. Reaching the final twelve, and in the money, Belinda Lee terminated Angela Garza, 5-3, while Brandi Booth slid by Garland, 5-4. Naomi Garcia fell to Pierce, 5-0, and Megan Hardin took out Ashton Barak, 5-3. Reaching the final twelve and in the money, Lee defeated Fendley, 5-2, while Booth eliminated Cox, 5-0. It was Pierce over Winkel, 5-2, and Trinh passing Hardin, 5-3. On the east side, Putnam edged out Aicinena, 7-6, and Robinson passed Watson, 7-6. In the hot seat match, Robinson overwhelmed Putnam, 7-0, capturing her second hot seat of the season. Back on the west side, Lee eliminated Booth, 5-4, and Aicinena, totaling five wins on the one-loss side, while Pierce nailed five herself, eliminating Trinh, 5-4, and Watson, 5-1. Pierce booked seven wins, ousting Lee, 5-3, and Putnam, to reach Robinson. It was a hard-fought final, as Robinson and Pierce fought for every opportunity at the table; Kim, vying for her first win of the season, and Robinson, her second. While both players were steady and focused, Robinson pulled ahead to win the first set, 7-5, and her second title of the 2019 Gulf Coast Tour season. The Tour would like to congratulate all the top finishers, and those players who reached a milestone in their game. In the second chance 9-ball event, Sophia Lopez went undefeated, while Marilina Nieves finished second. 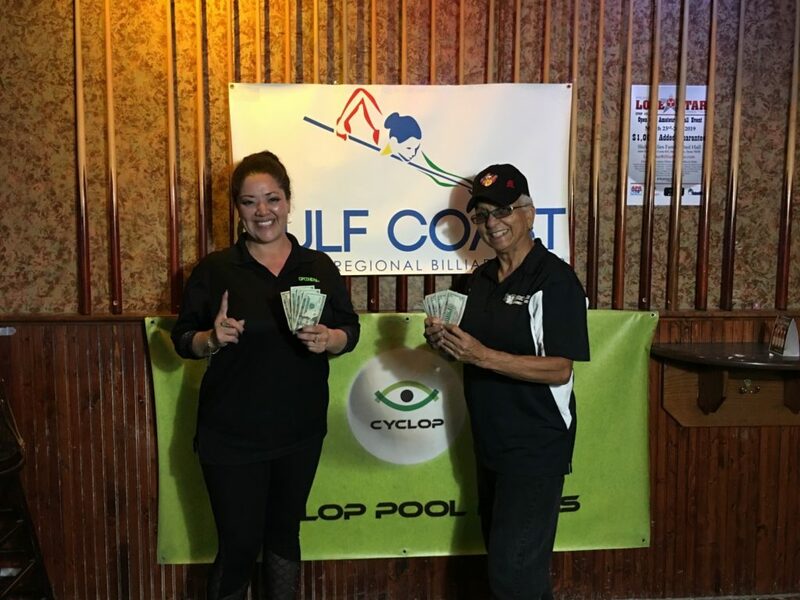 Wrapping up the weekend raffles, Terri Urban won a beautiful Poison AR3-6 playing cue, and Gilbert Catillo took home a “Zeus” set of Cyclop Pool Balls. Gulf Coast welcomes its newest members, Brittany Winkel, Sandra Sanchez, Barbara Wisdom, Kathy Tingler, Liz Galvan, Angelica Vergara, Carmel Luttrell, Clem Saenz, Amanda Salinas, Eeva Rodriguez, Isabel Hernandez, Monica Viera, and Yvette Martinez. Returning members include Lisa Bailey, Marilina Nieves, Edelina Flores, Megan Hardin, Naomi Garcia, and Stacie Putnam. The Tour would like to extend its deepest appreciation to the following Gulf Coast Tour Committee Members: Julie Acevedo who rand boards and sold raffle tickets, Celeste Espinosa who took care of Gulf Coast admin duties, and Kim Pierce and Toni Esteves who assisted with duties on the membership side, in addition to Naomi Garcia, Jackie Rodriguez, and Marilina Nieves, for their hospitality, and promotion of this event. The next event of the 2019 season is April 27th-28 at Slick Willies Family Pool Hall, located at 9310 Westheimer Road in Houston, Texas. For more information, visit www.GulfCoastWomensTour.com.